World Fair Trade Day | Small Farmers. Big Change. Karisa Centanni, education coordinator at the Honest Weight Food Co-op, a member owned and operated natural foods grocery store on Central Avenue in Albany travelled with Equal Exchange to visit CESMACH, one of our co-operative partners in Chiapas, Mexico. 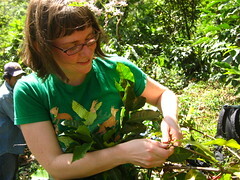 Ruth Ann Smalley, of the Honest Weight Food Co-op interviewed Karisa, and then did further research about the relationship between coffee and the environment. To read this interesting article, entitled, “The Birds and the Beans: Preserving diversity and promoting small farmers through cooperative coffee,” please go to Coop Scoop.